Mykonos (100 km²) with its 10.000 inhabitants is one of the most popular and famous islands in the Cyclades. You won't find more and better beaches on any other island and the local capital Chora is considered on of the most beautiful cities in all Greece. This combination is irresistible and not just with the common people. Mykonos has been and still is popular with the jet set. The rich and the beautiful meet here; the island is also a very popular destination for gay people. As a result prices went through the roof. The island mainly caters for the more wealthy people and their demands. If you are travelling on budget Mykonos may not be the ideal place. It is difficult to find a bargain. We recommend Hotel Elena in Mykonos Old Town. The only bigger town on the island is the local capital. Chora is probably the most picturesque and beautiful of all places in the Cyclades. The Greeks refer to it as the Greek Venice. White houses with blue shutters and window frames, narrow alleys, countless little churches and chapels … this is how you picture the Cyclades. If you arrive by boat be careful where you arrive. There are two ports. The old port is conveniently located in the very heart of the old town. The new port is about 3 km out of town. If you arrive there you'll have to take a bus or taxi into town. The "city centre" is around the old port. Here you find fancy night clubs and expensive discos. If you walk north from there you reach little Venice, the most beautiful part of Mykonos. Just behind little Venice are the famous wind mills. These are the once that are on pretty much every picture of Mykonos. If you go from the port into town (rather than along the sea front) you reach old town. It is the perfect place to get lost. There are loads of narrow alleys; basically a perfect labyrinth. Most of the capital is a pedestrian area. It's pretty, you have to give them that much. It doesn't really get more romantic than the old port with the water front. Small boats, pretty restaurants, fancy cafes, a little church and the broad promenade where – at least most of the time – you'll find pelicans. 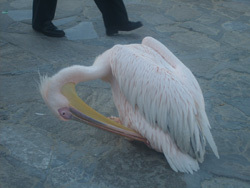 Mykonos is actually famous for them. At the left end of the port the boats to Delos depart. On top there are two rather nice beaches (Gilaos and Agia Anna) so what else could you possibly ask for? This is also the area where Mykonos famous night life is happening. Two classic places are the Scandinavian Bar and of course the Mykonos Yacht Club. One of THE landmarks of Mykonos is the quarter Little Venice. The typical white houses with blue window frames and shutters, narrow lanes with expensive souvenir and jewellers shops; everything looks like from a picture postcard. It's not just the looks. Here you find some of the finest restaurants in all Greece. The downside of being such an attraction is that during summer the place is packed with people. The windmills are probably the single most famous motif for photographers. Every day legions of tourists pose in front of them and take pictures. 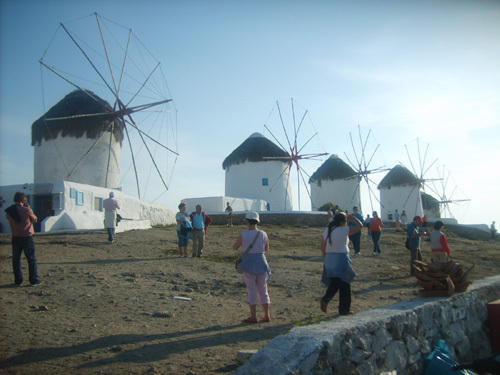 The windmills turned into an iconic symbol for the Cyclades islands. 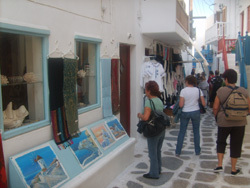 The old town is the most exciting part of Mykonos. It's actually quite big. The best way to approach is to just walk in and get lost. It is really pretty. 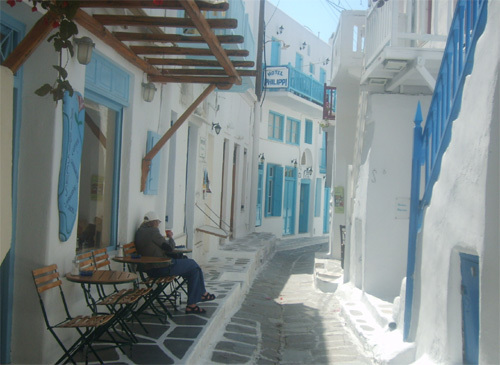 The houses follow the Cycladic style – white and blue – but are more colourful than for example in Little Venice. Even the pavement looks cool. It is build with dark slabs with white joints. On every corner you find and some new and exciting shop or restaurant or bakery, you name it. There are quite a few classy restaurants hidden in the old town of Mykonos. You better check the menu up front. You can easily spend a 100 Euro on a meal. Also very impressive are the many little churches and chapels. The restaurants on the island are expensive. The price level could actually be compared to the real Venice. 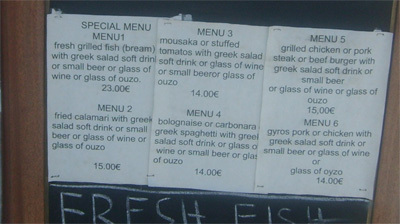 Even a basic meal like Moussaka will easily cost you 15 Euro. Quite a few of the restaurants there don't even pretend to be reasonable. They offer exquisite French and Italian cuisine. If you travel on budget finding something to eat can become a challenge. It is not impossible though. The classic is a Gyros Pita. You get them for less than 3 Euro and they can serve as a meal. Another good place to check out is the bakeries. Some of them have reasonably cheap traditional pastries. Reasonable without being cheap is Taverna Nikos behind city hall just next to the harbour. You will pay more than on most other islands but at least you don't have to declare bankruptcy afterwards. If you are not on budget and like it fancy try "La Maison de Katarines" (French cuisine) and – slightly less expensive – Bourazza with excellent Greek cuisine. Both are hidden in the Old town. Outside of city centre places get a little less expensive. Most clubs are in the area around the harbour. Another epicentre is in Xenia Street near the windmills on the way to the bus station. Most of the bars actually cater for a gay audience however; there are bars where you will find a mixed audience. It is very difficult to recommend a place since the "in and out" list changes quickly. I therefore won't. I'm not big on bars anyways. I quite liked the bar at the Paradise Beach though. It is reasonably cheap and rocks. The nightlife on Mykonos is extensive. Every night thousands if not ten thousands of party seekers roam the streets. Party on! Once again, if you travel on budget you are in the wrong place. It is literally impossible to find an at least reasonably cheap place to stay. With the rich and beautiful Mykonos is as popular as Saint Tropez. To find a room for less than 70 Euro a night is impossible. There doesn't seem to be an upper limit to room prices. Even it low low season – and I don't just mean outside of high season – a room will easily cost you about 45 Euro. This has nothing to do with occupancy. Most of the rooms might be empty but they are still expensive. 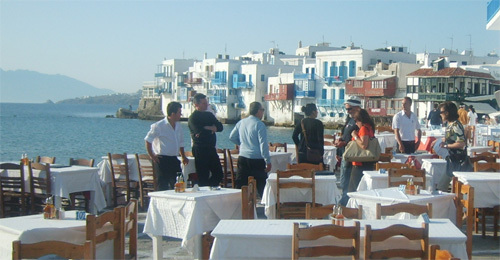 On this website you can book cheap rooms in Mykonos. When you arrive at the port there will be a crowd of locals offering you rooms. Offering on this occasion means shouting and almost harassing you. Be careful and check where the room is located. Most of the "good deals" are cheaper because they are miles away from town. Also, some of the luxurious apartments turn out to be total dumps. Among the hotels I would recommend Hotel Elena in the old town. It's not too bad and with around 100 Euro in the saison for a room with breakfast almost reasonable. Also good prices has Hotel Milena, about 15 minutes by foot from the centre. Vista Apartments has reasonably priced studios in the old town of Mykonos. The only way to save a few bucks is to spend the night outside of Mykonos town. Recommended is Paradise Beach Resort. It is a camp site that also has rooms and tents to rent. The bar there I already mentioned. 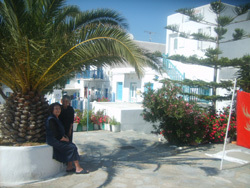 There are no bigger towns on the island other than Chora. Very popular are the beaches. The most famous beaches are in the south of the island. Most popular with the gay community is Super Paradise Beach. Other popular places are Paradise beach and Agrari-Paradise in the south and Ormos Panormos in the north. You'll find tavernas and some sort of accommodation on all of them. The prices are somewhere in between OK'ish and expensive. During summer they have a tendency of being rather pricy but that's just the way it is on Mykonos. There are frequent busses from Chora to all major beaches. Only Super Paradise beach is rather difficult to reach by bus. The bus terminal for the beaches in the north is just next to the old port. The busses to the much more popular beaches in the south leave from the other bus station that is situated just outside of the Old town and – what a surprise – rather difficult to find. It makes no sense at all but is a very Greek approach. During summer the busses leave at least every hour and until late at night. With many people staying outside of Chora even the late busses are often packed with people. 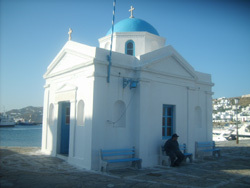 The ferry port is one of the biggest in the Cyclades, second only to Paros. There are plenty of direct connections to Paros, Naxos, Ios, Santorini, Crete, Delos and of course Athens. You can also get to the smaller Cyclades islands by boat, ferries will be less frequent though. If you are planning to go to Crete from here be prepared; expensive catamarans are pretty much the only available options. You'll easily spend a 50 Euro one way. Since Mykonos is mostly popular with people that are unfamiliar with the concept of budget travelling you'll see a lot of the catamarans. They are quick but they are also twice as expensive as regular ferry. Day trips to Delos are a popular thing to do. The boats depart from the old port right in the city centre. You'd normally leave in the morning and return in the afternoon. A return ticket cost 12.50 Euro (May 2008). You are not allowed to spend the night on Delos so having a return ticket is compulsory. Mykonos has a pretty big airport – second only to Santorini. There are quite a few direct flights from the major European capitals. Needless to mention that there are also plenty of flights from and to Athens.